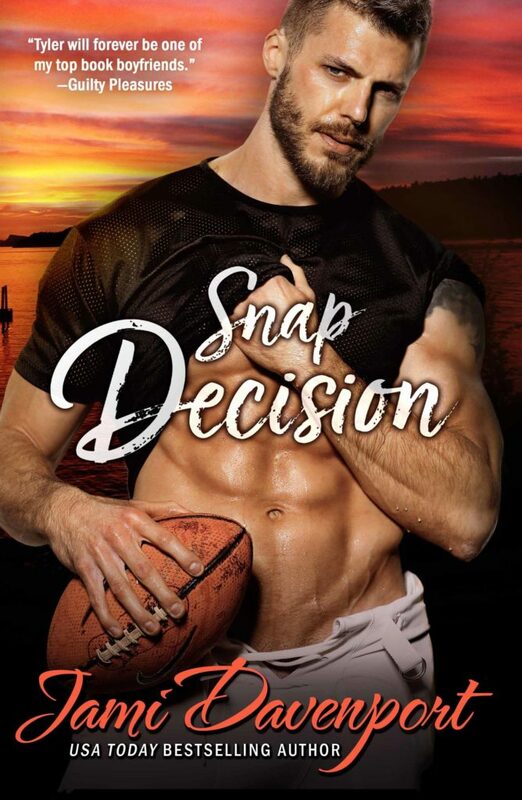 Snap Decision is another winner from Jami Davenport. This time our hero is Star Quarterback with the Seattle Steelheads, who has reached a turning point in his life. Tyler Harris who hides behind his BAD BOY persona where he doesn’t care about anyone but himself. When he is left his family’s run-down mansion on Madrona Island, under the condition he must spend 90 nights on the Island. This is where he meets Lavender and all the old vets who were his uncle’s friends. This is a fun romance for the most part, especially the orange cat and the brotherhood to keep him occupied. Tyler and Lavender spent their time insulting each other, the worse the insult the hotter they were together. This is Jami at her best, it kept me entertained, and this was I have to finish book once I started reading, I didn’t want to put it down. It never hurts when you have a handsome well- built Quarterback to think about. This is a thoroughly enjoyable read, I spent half the night reading. Tyler and Lavender are hilarious together, as long as they hate each everything will be okay.Unfortunately for them this bad boy had plenty of heart.